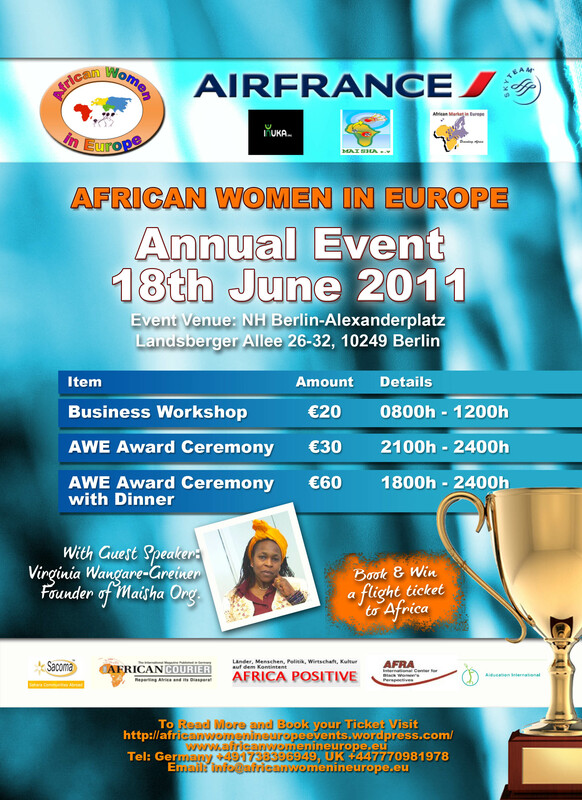 The first AWE Award 2011 was held in the trendy city of Berlin on the 18 July . The AWE Awards was launched with the aim to acknowledge African Women in Europe and their impressive achievements in the communities in which they live including those located across the African continent. The event attracted over 50 participants living in cities across Europe such as Amsterdam, Geneva, London, Hamburg, Berlin and Paris. The main cities in Europe were more than adequately represented during the event. The event’s program kicked off on Friday evening with a social/cultural meet-up right in the heart of Berlin. The participants met at an African themed restaurant where they could network informally and start to get to know each other in an informal atmosphere before the more formal part of the program started. Saturday morning started with the formal part of the event, a workshop facilitated by Kanini Mutooni, Founder and CEO of MyAzimia Ltd and Inuka.org. The title of the workshop was: taking the leap of faith and starting your own business’ and targeted women who already had businesses and those considering taking the plunge. The session was very interactive and involved women sharing their experiences and tips whilst Kanini provided a structured view on the more formal parts of starting a business such as writing a business plan, creating a business model and raising capital for a new business. The workshop was then followed by a bus tour to sample the sights and sounds of the beautiful historical city of Berlin.